Wake up Christmas morning and pop this pretty-as-a-picture bread in the oven for a fresh-baked breakfast treat. Its jolly simple to make with frozen bread dough, dried apricots, golden raisins and tart cherries, plus a touch of gooey cinnamon sugar and honey. 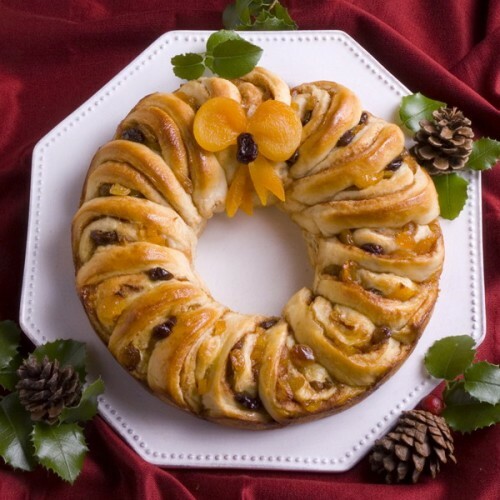 No special pan needed, just a round baking dish and a small oven-proof bowl to hold the wreath shape. Prep the night before and let rise in the refrigerator, or fill and roll in the morning using thawed bread dough. Need something else for your morning menu? Rosie’s Potato Kale Hashbrowns mix together in minutes with frozen hashbrowns, and Rita’s Waldorf Salad with tangy orange dressing is fresh and crisp. I like the salad with a dark red skinned very aromatic apple I bought recently at Whole Foods called Black Arkansas, a mid-19th century variety related to the winesap apple family. However you enjoy your holiday morning, we wish you a Merry Christmas! Butter a 9-inch round cake pan, leaving center of pan clean. Place a small oven proof dish (such as a 6-oz glass Pyrex) in center of pan. Roll dough to a 14 x 10-inch rectangle on a floured surface. If dough springs back, let rest 5-10 minutes then continue rolling. Spread 2 tablespoons butter evenly over dough. Combine sugar and cinnamon in a small bowl. Sprinkle cinnamon sugar and drizzle honey evenly over dough. Scatter apricots, golden raisins and cherries over dough to within 2 inches of one long edge. Starting at fruit covered long edge, tightly roll dough and pinch closed along opposite side. Bake in preheated 350ºF oven 25-30 minutes until golden brown. Immediately turn out onto a plate; invert onto another plate so browned top side is up. Use two apricots and a cherry for a “bow”, and sliced apricot for “ribbon”. Place on wreath. Serve warm or cool. Thank you Susan! I’m equally smitten with your Lemon Roasted Fennel — I’m thinking of it as a side with Christmas brunch. hey, we’ve got a plan! I love the your combination of raisins with lemon and orange.